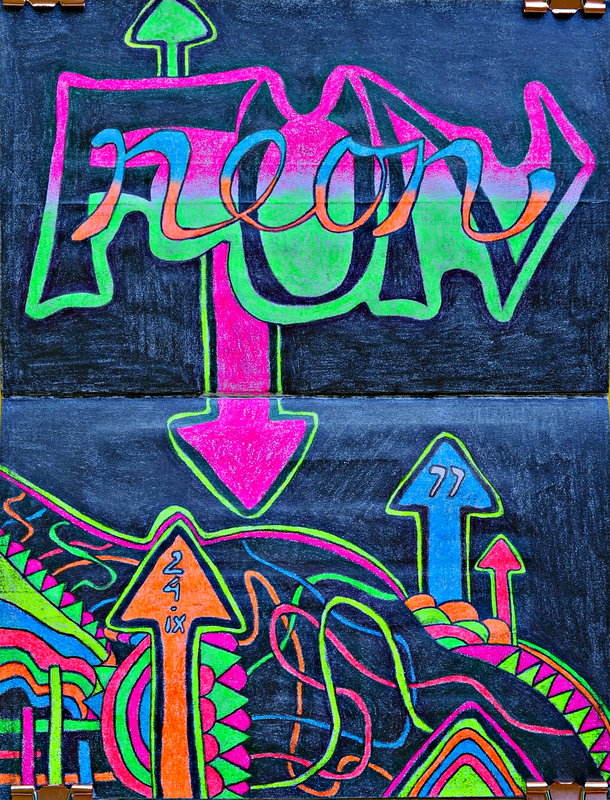 All started with the great Neon Dry Markers by KOH-I-NOOR. First I just wanted the set of six highlighter pencils in bright neon colours. Then I needed a good project. 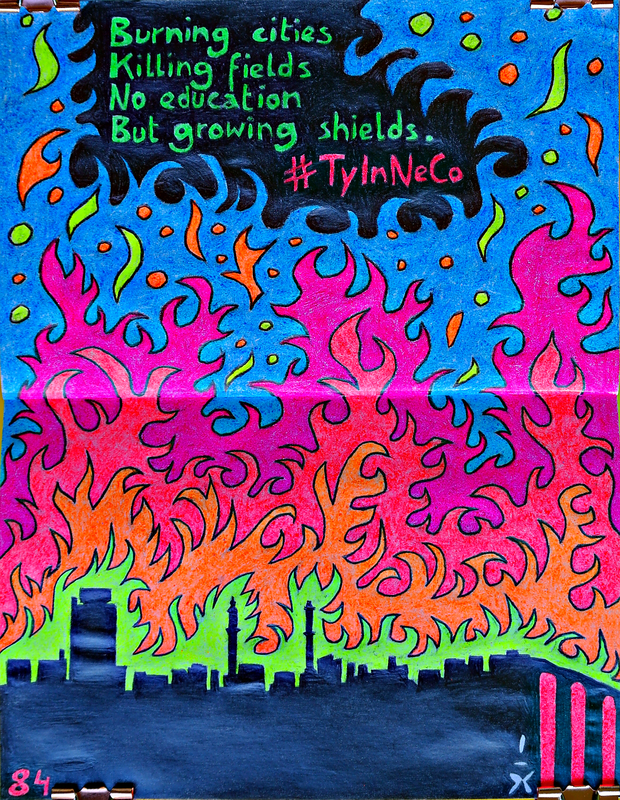 Very soon, Tyranny In Neon Colours, abbreviated with #TyInNeCo was born. This is the home for the growing project. Everything started with this drawing. It’s hidden under the link because it doesn’t actually belong to the #TyInNeCo series. But it was me trying and playing around with the pencils. They worked well (and I also highly recommend them), so I wanted to do a whole series with them. Thinking about ideas and possibilities, I instantly knew that I needed to stay in the present time with all its wars and fears and uncertainties. Earth has got a rich history of tyrannic leaders (who aren’t really leaders but only narcissists), and I instantly liked the obvious dichotomy of bright and happy colours on one side, the dark and bad evil on the other. This is where the name of the project came in. And this is the page that I will regularly update with new additions to the project. Just one last thing: the drawings don’t look very fancy (with the ugly joint in the centre) because I use Reclams Universal-Notizbuch for the drawings. It’s rather small, so I use two pages. 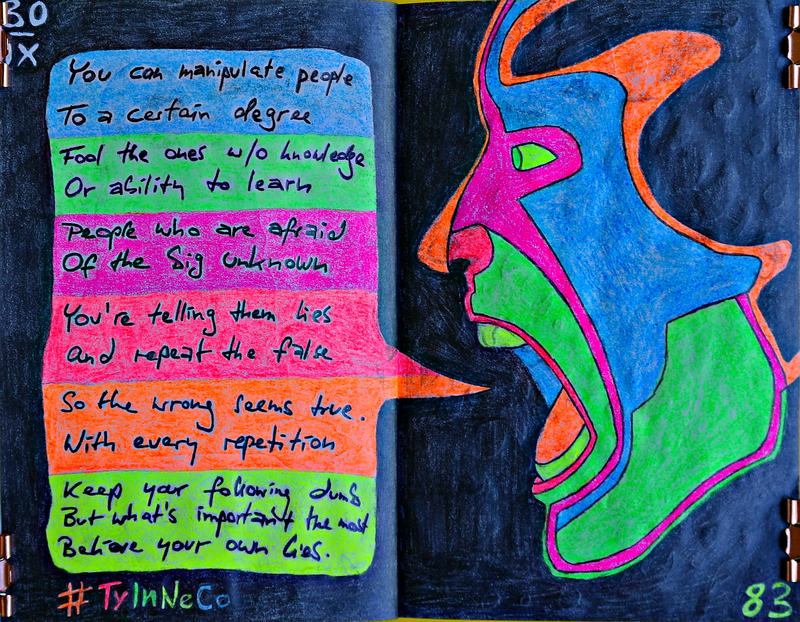 With those notebooks I started another project last year: one drawing per day. 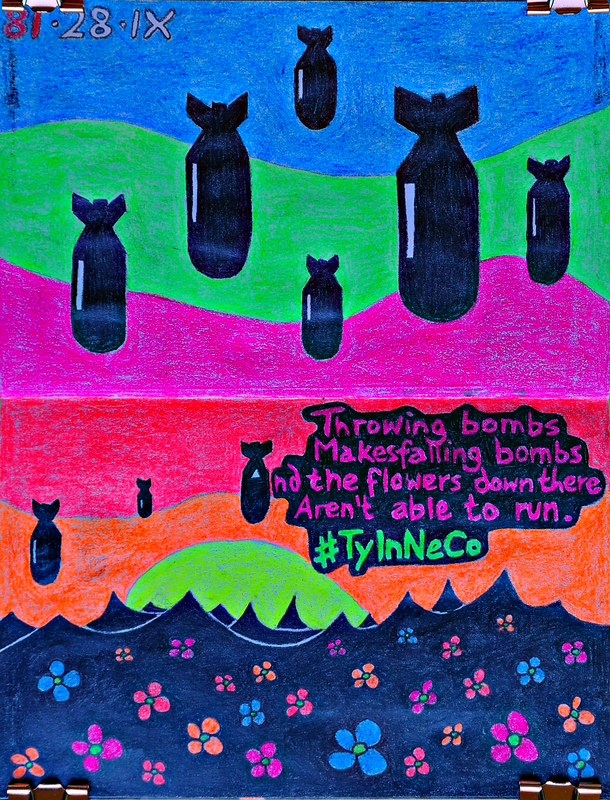 It didn’t quite work this way but #TyInNeCo is just a tiny project within this bigger project. That’s why you’ll notice the various dates and numbers on the drawings. Inspiration for this drawing obviously was the still ongoing war in Syria. What happens there, what Assad does to his people, is unbearable. And still it happens every day. Many Syrians already tried to escape the horrors and cruelty. But their home is lost for generations. Their cities destroyed. So, I thought the little flowers that aren’t able to run away from the huge bombs make for a harsh enough contrast of what’s happening in every modern war. The inspiration for this second drawing was Donald Trump and his own made-up stories, fake news and tirades about everyone but himself. Every single day the man makes the headlines with fantasy stories and statistics because he loves it when everyone is speaking about him. Doesn’t matter that every word coming out of his mouth isn’t even close to the truth. Doesn’t matter that he doesn’t have any tiny idea about politics and that he’s basically doing everything to start World War III as soon as possible. He’s got his dumb following that voted for him to make him president of the U.S.A. Welcome to the future! The war in Syria is still ongoing. Civilians are killed and no-one cares. Gas is used on innocent people and the cities look worse than cities after World War II. I used the city skyline of Aleppo in Syria for the third drawing of the series, the silhouette of the city prior to the war. On the right hand side there is the idea of the ancient town of Aleppo. And to be honest, I don’t really want to see what’s left. The burning city, a dictator who doesn’t care about his people. Nothing new from the Near East.